Very Excited for y’all to hear @postmalone and my song in the new Spider-Man movie 🕷 “SunFlower” 🌻🌻COMING SOON !!!!! 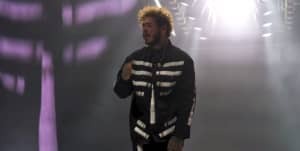 Last week, Post Malone gave fans a short teaser from a new song that will appear in Marvel's upcoming animated Spider-Man movie Spider-Man: Into the Spider-Verse. On Tuesday, Swae Lee revealed that he is also on the track — titled "SunFlower" — and shared an extended preview along with some animated footage that may be from the film. Thumbnail image courtesy of Gabe Ginsberg/Getty Images.